Shabbier than human, smarter than the cleverest apes orangutan and chimpanzee. The Kerinci people called it uhang pandak, a Sumatran wildman. In Bahasa, it means “the short man”. Uhang pandak had some times been caught in the Kerinci Seblat National Park. Meet the Anak Dalam tribes (literary means “children of the inner-forest”), a.k.a. Orang Kubu, a.k.a. Orang Rimba, a.k.a Orang Batin Simbilan. They are nomadic tribes who have traditionally lived throughout the lowland forests of Jambi and South Sumatra. Anak Dalam tribe and Uhang pandak has been a co-inhabitant in the forest for centuries. 80-130 cm tall. Covered in short, grey to brown fur. Divergent big toe, separated from other toes as a thumb is from the other fingers. Ground dwelling, not arboreal. Walk in two legs. Maybe omnivorous like any other apes or hominid, as sometimes they sought the corns, potatoes, fruits, ginger roots, sometimes insects and river crabs. In this kingdom (Lambri, now Jambi Province) are found men with tails, a span in length, like those of the dog, but not covered with hair. The greater number of them are formed in this manner, but they dwell in the mountains, and do not inhabit towns. Uhang pandak was left uninvestigated until the British author and researcher Deborah Martyr made a professional trip to Sumatra Island in 1989. Funded by Fauna and Flora International, Martyr came along with British photographer Jeremy Holden. She began to collect the proofs and witnesses systematically with interview and camera-trapping methods. Martyr herself have encountered uhang pandak several times during 1990-2005. Also there found some tracks resembled those of a seven-year old child, but were broader and had a big toe. 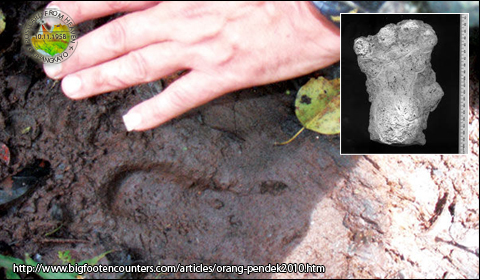 She took plaster casts of the footprints to Sungeipenuh Regency. However, she thought that what she found were still far from scientific, legitimate proofs. Her Uhang Pandak Project was then terminated. Try to browse this subject on Internet, you’ll find that a lot of researchers jumped to it with their own version. They came from all around the world. In 2005, National Geographic funded a camera-trapping project in Kerinci led by Dr. Peter Tse of Dartmouth College. Unfortunately, the project ended in 2009 without any significant result. Is it because uhang pandak in fact only live in people’s mind? Is it just a crypto creature like yeti or Loch Ness monster? In other words, is uhang pandak only an undocumented primate? But uhang pandak may also be really a hominid. The experts speculate its connection to the relatives now. You know, in October 2004, the scientists published the discovery of skeletal remains of a new species of human (Homo floresiensis) in caves on Flores, East Lesser Sundas from as recently as 12 millennium ago. Homo floresiensis was described as being around one meter tall. 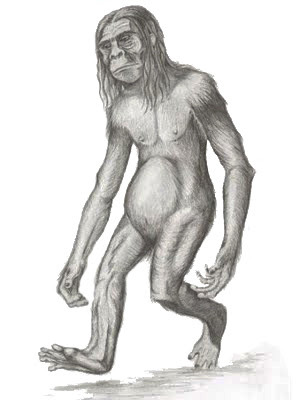 The discovery has renewed the speculation of Indonesian existing hobbits. This creature, are they real? It’s still a mystery 🙂 But Homo florensiensis is real. And they might be connected.